It's the weekend and I thought I'd take a break from a wine-related post today. We had a couple of great pizzas for lunch today that I wanted to share with you. Bollini's Pizzeria Napolitana has been open at 2315 S. Garfield Avenue in Monterey Park (323-722-7600) for two or three months, I think, and has been the subject of mostly very favorable reviews on the Chowhound.com board. I've been meaning to try it out and finally today I had the chance. There were five of us and it was pretty cramped because there's only a narrow seating area; they had to push a couple of tables together and squeeze us in there but that's okay. We ordered a couple of large (16") pizzas: The Rocco, topped with pepperoni and basil, and Salsiccia 3, topped with three-pepper sausage, red and green peppers, Italian peppers, goat cheese and basil. Oh, and of course there was tomato sauce and cheese on both. That's a picture of the Salsiccia 3 above, and the Rocco is below. Sorry that I forgot to snap pictures before we took some slices. I always do that. Looks good, eh? Well, they were good. Very good. Chef and owner Christiano Bollini (looks just like his picture on the website) takes the time to make everything fresh, so it took a while for the pizzas to arrive. Meanwhile, he comped us a small order of stuffed mushrooms while we waited and those were delicious. The pizzas arrived and we dug in. They're made in the "Napolitana" style which I assume means with a very thin crust. 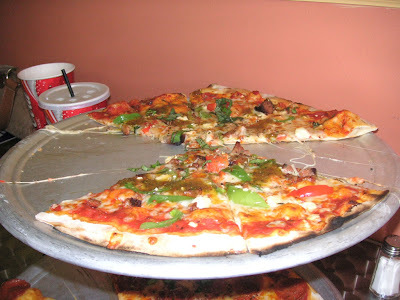 The menu advises ordering no more than two or three toppings because the thin crust can't really support much weight so don't expect topping overload like you might find at Petrillo's, or places that have a more substantial crust. To me, the test of a pizza is the crust. These passed with flying colors. Thin, yet with just the right amount of "tug and chew" to them, they were charred but not crispy or tough on the edges, and properly chewy in the middle. No soggy middle here! The tasty and obviously fresh toppings, sauce and cheese all combined for a very well-balanced pie with no one item pushing the others into the background. Everyone preferred the Salsiccia 3, although they were both delicious. I didn't think about seeing if they serve beer or wine (I don't think they do) but we all had soft drinks from a serve-yourself fountain. The cups are large size. Two very good pizzas, 5 sodas, $34 bill including tax before tip. Quite reasonable. We got there around noon and the place was about 2/3 full (I was told there's 24 seats). When we left, a little before 2:00, there were a lot of people waiting. It's a popular place! And for good reason. You order at the counter, they bring you the food and when you're done you pay at the counter. When I went up to pay I told Mr. Bollini how much we had enjoyed the pizzas and also told him I'd heard about his place on Chowhound.com. He looked at my t-shirt. I happened to be wearing the t-shirt my sister gave me that said "Monku Monku" on the front. He said, "Monku.. you're Monkuboy!" I said, "That's me!" (If you're confused, I am Monkuboy for food and Monkuwino for wine). And that was our visit. When we left, the place was hopping. Normally Saturday afternoons are pretty dead lunch-wise at most restaurants but apparently word has gotten around about Bollini's. It's well worth a trek out there to give them more business. Bollini's gets two thumbs way up! Miscellany: The other day I checked the temperatures on my still chugging-away Emerson wine units and noticed that the one on the left was up at 61.4 degrees. That got me a bit alarmed. I thought maybe the temperature sensor had made its way into some strange place inside the cabinet so I opened it up and positioned it more in the middle. Now the readings are ranging from the high 55's to low 57-degree range. Such a difference from moving the sensor just a wee bit? I'm kind of mystified but not complaining. All the while the built-in digital thermometer on the unit keeps saying it is 57 degrees inside. The unit on the right side says the same thing but its standalone thermometer says 59-60. Well whatever, they're staying cool in there. will have to try this place. also really good is Vito's on La Cienega. Maybe worth the trip all the way from San Gabriel Valley! Bollini's is well worth it. 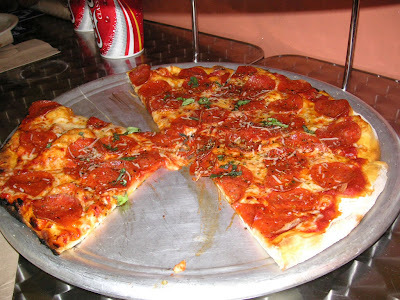 I would love to try Vito's but I need to get over my aversion to driving out to the Westside and all that traffic! I grew up on that side of town and fondly remember driving up La Cienega to get to Hollywood, eating lots of pizza at Damiano's, etc., but since I settled in the SGV I hardly ever go out to the westside anymore. But Vito's is still on the wish list of destinations, though! Looks so good. Compared to Compari's? Equally good tug and chew? Just to clarify, we're talking about the old Compari's in Westchester (Inglewood?) that is no longer there.. it's been such a long time my old memory is failing but Compari's is still the king crust-wise. But Bollini's is awfully good! There's a great review with pictures on this blogger's site: http://tinyurl.com/2qghbm. Interesting post... I can see that you put a lot of hard work on your blog. I'm sure I'd visit here more often. George from weekend breaks.